Evidence that the US Administration may well have more in mind for Haiti than the improvement of the lot of the devastated Haitian people can be found in nearby waters off Cuba, directly across from Port-au-Prince. In October 2008 a consortium of oil companies led by Spain’s Repsol, together with Cuba’s state oil company, Cubapetroleo, announced discovery of one of the world’s largest oilfields in the deep water off Cuba. It is what oil geologists call a ‘Super-giant’ field. Estimates are that the Cuban field contains as much as 20 billion barrels of oil, making it the twelfth Super-giant oilfield discovered since 1996. The discovery also likely makes Cuba a new high-priority target for Pentagon destabilization and other nasty operations. The remarkable geography of Haiti and Cuba and the discovery of world-class oil reserves in the waters off Cuba lend credence to anecdotal accounts of major oil discoveries in several parts of Haitian territory. It also could explain why two Bush Presidents and now special UN Haiti Envoy Bill Clinton have made Haiti such a priority. As well, it could explain why Washington and its NGOs moved so quickly to remove– twice– the democratically elected President Aristide, whose economic program for Haiti included, among other items, proposals for developing Haitian natural resources for the benefit of the Haitian people. A US military occupation of Haiti under the guise of earthquake disaster ‘relief’ would give Washington and private business interests tied to it a geopolitical prize of the first order. Prior to the January 12 quake, the US Embassy in Port-au-Prince was the fifth largest US embassy in the world, comparable to its embassies in such geopolitically strategic places as Berlin and Beijing. 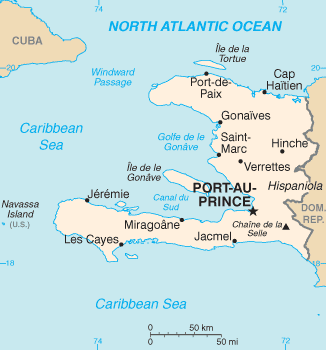 With huge new oil finds off Cuba being exploited by Russian companies, with clear indications that Haiti contains similar vast untapped oil as well as gold, copper, uranium and iridium, with Hugo Chavez’ Venezuela as a neighbor to the south of Haiti, a return of Aristide or any popular leader committed to developing the resources for the people of Haiti, — the poorest nation in the Americas — would constitute a devastating blow to the world’s sole Superpower. The fact that in the aftermath of the earthquake, UN Haiti Special Envoy Bill Clinton joined forces with Aristide foe George W. Bush to create something called the Clinton-Bush Haiti Fund ought to give everyone pause. 16 The Aristide development plan was contained in the book published in Haiti in 2000, Investir dans l’Human. Livre Blanc de Fanmi Lavalas sous la Direction de Jean-Bertrand Aristide, Port-au-Prince, Imprimerie Henri Deschamps, 2000. It contained detailed maps, tables, graphics, and a national development plan for 2004 “covering agriculture, environment, commerce and industry, the financial sector, infrastructure, education, culture, health, women’s issues, and issues in the public sector.” In 2004, using NGOs and the UN and a vicious propaganda campaign to vilify Aristide, the Bush administration got rid of the elected President. Very useful and informative article. I have learned a great deal, thank you and keep up the good work.